It's the first post of September, and you know what that means!!!! That's right, today I'm bringing you my September Nail Artist of the Month. 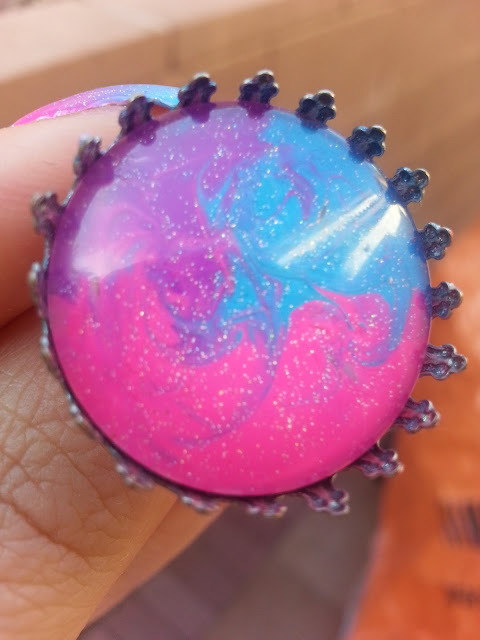 My goal is to bring you fresh, new artists who are rather unknown to the nail art world. If I select your account from Instagram, I typically see if you have less than 1,000 followers. While the girls who have over 1,000 are amazing as well, I want everyone to have their chance of hitting that 1,000 milestone. Since I was having some issue deciding who to pick, I posted on Instagram asking for help from some of my followers. My September Nail Artist of the Month, the amazing Leslie from triracialbeauty2, posted that I should select her. Now normally, I would have passed this, but I kinda liked her boldness. I clicked on to her Instagram and quickly fell in love. With each of her manicures, she paints up a matching ring, which was just amazing to me. You'll see. Enough of my babbling! Polished peeps, please welcome Leslie! Hey girls(and guys if there are any)! I jokingly through my name out there when Alaina was asking for recommendations for her Nail Artist of the Month. I didn't actually think she'd contact me but I was SUPER flattered that she thought my work was good enough to share on her blog. Today I did a kitchen sink mani because I couldn't think of one thing I wanted to do. On my pinky, I used the saran wrap techniche. 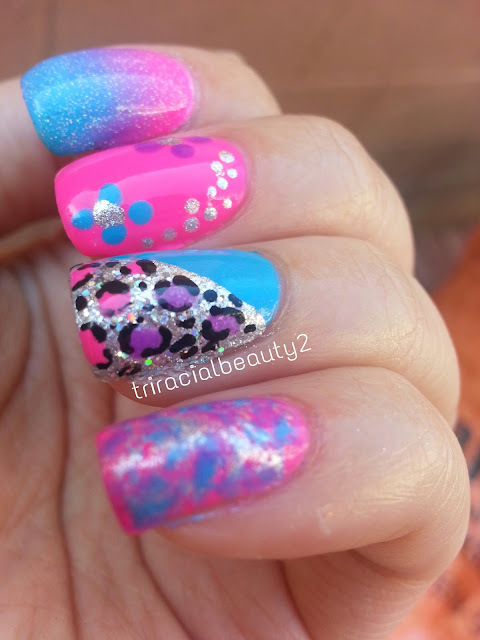 On my ring finger I used regular tape to create a diagonal space to add glitter polish and some cheetah print which I created with a dotting tool. My middle nails just has a couple of flowers that I created with a dotting tool. 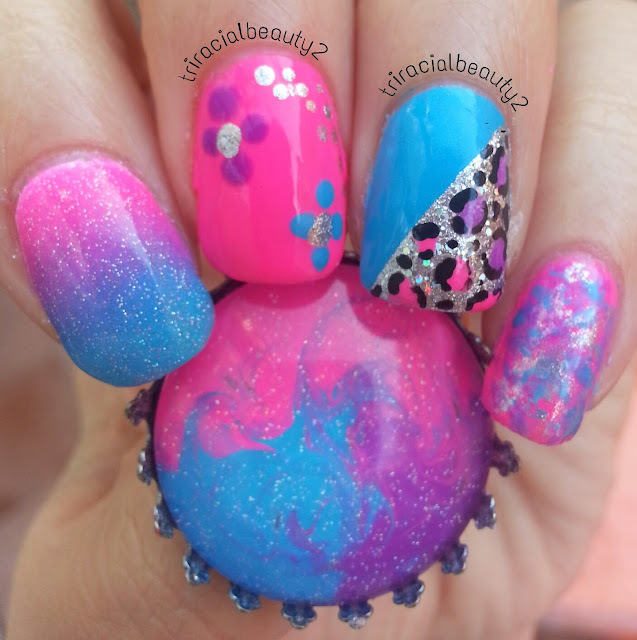 On my index finger, I did a pink and blue gradient and topped it with a glitter polish. The thing I'm holding is a cabochon ring that I paint with every manicure. I wanted to stick with the kitchen sink mani theme and only have the colors match the manicure. What an amazing kitchen sink manicure! I'm in love with the colors and all the techniques used! Seriously, flawless. And that ring! Ahhh I want it! Thank you so much for this amazing post!!!! If you want to see more of Leslie's designs, head on over to her Instagram and make sure to follow!!! As for all the other lovely ladies who were mentioned in the comments of that post, I am following all of you and you are on my radar to be featured!!! !